Peppered Cories are delightful little fish that help keep the bottom of the aquarium clean by eating up leftover foods! The Peppered Corydoras Corydoras paleatus are some of the most common and well-known aquarium fish. They are hardy, adaptable, peaceful and easily bred. They have been kept in home aquariums for over 100 years, first introduced in 1876, and are possibly one of the first species to be successfully bred in captivity. Reports of successful breeding date back to as early as 1893. Many of the specimens available today are domestically bred rather than imported from the wild. These Corydoras are small, good looking catfish that reach only 2.3 inches (5.9 cm) in length. They can be be found in various colors and patterning, depending on where they originate from. But overall they are mainly bronze with gray patches and specks. A number of common names are used to describe them including Peppered Corydoras, Peppered Cory, Peppered Catfish, Paleatus Corydoras, Blue Leopard Corydoras, Salt and Pepper Cory, and Mottled Corydoras. There is also a long-finned variety of the Peppered Corydoras as well as a pseudo-albino variety. The albino form was selectively developed from darker-bodied Paleatus Corys crossed with a colorless Corydoras variety. It is pinkish white in color and is simply referred to as an Albino Cory or more specifically as Albino Paleatus Cory. This form is very similar to other Albino Cories, especially the albino form of the Bronze Corydoras Corydoras aeneus, though the Albino Aeneus Cory has a more pink to orangish coloration. Peppered Catfish are a great choice for beginners. 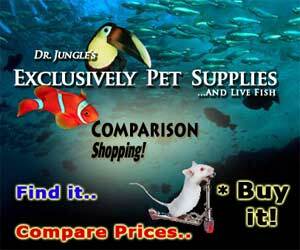 They are very suited for a small aquarium and will delight you with their constant activity. They make an excellent addition to any peaceful community aquarium. Good tank mates include Danios, Livebearers and Tetras. Because they are schooling fish, they enjoy the company of their own kind as well, and do best kept in groups of at least 3, though 6 or more are better. These small catfish will breed rather easily too, and it is very interesting. The female will drop a few eggs and catch them with her ventral fins, carrying them about to deposit them here and there about the plants and decor in the aquarium. The Peppered Corydoras Corydoras paleatus was described by Jenyns in 1842. They are found in South America in the Amazon basin, in the La Plata river in southeast Brazil, in the Parana River of Brazil, Paraguay, and Argentina, and in Uruguay. Other common names they are known by include Peppered Cory, Peppered Catfish, Blue Leopard Corydoras, Mottled Corydoras, Paleatus Cory, Peppered Cat, Pepper Cory, and Salt and Pepper Cory. In their natural habitat schools of Peppered Corys inhabit slow-moving, almost still waters that are shallow and clear They are generally found in smaller-sized streams, tributaries and along the margins of larger rivers as well as marshes and ponds. They feed on worms, crustaceans, insects, and plant matter. Social Grouping: Groups - They are normally seen in schools of 20 or more fish. The Peppered Cory is a small catfish, reaching only 2.3 inches (5.9 cm) in length. They come in a variety of colors and patterning's, depending on where they originate from. Overall they are a light tan to bronze marked with gray patches and specks. They have a lifespan of 10 to about 15 years with proper care. 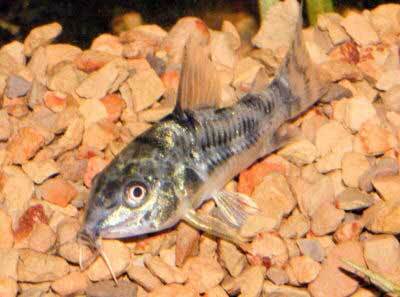 The Peppered Cory belongs to the catfish family Callichthyidae, and like all catfish they are scaleless. Corydoras are known as armored catfish because they have two rows of bony plates, called scutes, along the length of the body. Like all catfish, they also have pairs of barbels around the mouth and strong, rigid spines on their dorsal and pectoral fins. The Paleatus Cory has also been known to produce sounds of warning when distressed and when courting. They make sounds by by rubbing the spines of their pectoral fins into grooves of their shoulder plates. There is also a long-finned variety of the Peppered Corydoras as well as a pseudo-albino variety. The albino form has been developed from darker-bodied Paleatus Corys and is simply referred to as an Albino Cory. This albino is very similar to other Albino Corys, especially the albino form of the Bronze Corydoras or Green Corydoras Corydoras aeneus. The Paleatus Albino Cory can be distinguished from the Aeneus albino by its longer snout and having a bit more slender appearance. Lifespan: 10 years - They can live for 10 years, and up to about 15 years with optimal conditions. The Peppered Catfish is a hardy fish and makes an excellent addition to any peaceful community aquarium. They are quite durable and great for beginners. However, although they can withstand a variety of water conditions, this fish does not tolerate warm temperatures over 85 ° F very well. Additionally, it will not thrive with aggressive fish. They require clean water that is high in oxygen and a good supply of food on the bottom of the tank. These fish do a great job keeping the bottom cleaned of food and debris, but if the tank is not yet established, make sure to add algae wafers to the tank for food. A filtration system is needed that maintains clean water and ensures the entire tank is highly oxygenated. In this regard, surface movement of the water is desirable for replenishing the water with oxygen. Be careful when netting them because when they feel threatened they extend their sharp spined fins outward and lock them in a rigid position. Although the spines are small, just like this catfish, they are quite sharp and can pierce your skin. Peppered Corydoras are omnivores that feed on worms, crustaceans, insects, and plant matter in the wild. In the aquarium they are not hard to feed at all. These ready feeders will generally eat all kinds of live, fresh, and flake foods. To keep a good balance give them a high quality sinking pellet or flake food everyday. Also offer occasional algae wafers. Feed frozen and live food, such as brine shrimp, blood worms, or daphnia as a treat. Tablet / Pellet: Yes - High quality sinking pellets and algae wagers can be offered. Feeding Frequency: Daily - Feed as much as they will eat in about 5 minutes. They can be fed twice a day, offering as much as they will consume in about 3 minutes each. Regular water changes with siphoning of the gravel is crucial to remove their waste and keep the tank clean. Their barbels are prone to infection from a poorly kept substrate. Change 10% to 25% of the water weekly or biweekly, depending on how high the bio-load is in your aquarium; and 80% once a month to keep up with the bio-load and for optimal health. If oxygen levels drop these fish will swim to the top and gulp air and then swim back down. Excessive gulping may be an indication that the water needs more oxygenation. If air gulping becomes a common occurrence it may be time to do a water change or increase surface water movement. An undergravel filter that is regularly vacuumed works well for this fish to keep the substrate clean and the entire tank oxygenated. Water Changes: Weekly - Weekly water changes of 25% weekly and 80% once a month are recommended to keep the tank from becoming heavily fouled. A minimum aquarium of 10 gallon is suggested for the Peppered Catfish, though 15 to 20 gallons would be much better to keep a school. The aquarium should be decorated, and arranged with their natural habitat in mind. This Corydoras catfish enjoys a tank with lots of plants. Also provide other decor to create hiding places, including rocks and driftwood. Because these fish have sensitive barbels it is preferable to use sand or fine gravel to keep their barbels in good condition. Larger gravel with sharp edges may actually cut the barbels down until they are completely gone. The barbels are also prone to infection from a poorly kept substrate. An undergravel filter that is regularly vacuumed works well for this fish to keep the substrate clean and the entire tank oxygenated. Minimum Tank Size: 10 gal (38 L) - 15 to 20 gallons is better to keep a school. Substrate Type: Sand - Sand or fine gravel. These catfish constantly root around in the ground, and their barbels may be damaged by a sharp substrate. Lighting Needs: Moderate - normal lighting - They like higher light levels than most other coryadoras species. Temperature: 72.0 to 79.0° F (22.2 to 26.1° C) - Wild caught specimens need the cooler end of this range, and none of the Salt and Pepper Corys will tolerate extremely warm temperatures (over 85° F). Breeding Temperature: 71.6° F - 71.6 - 78.8° (22-26 ° C.) is needed for spawning. Water Movement: Weak - Weak to moderate is preferred. Peppered Corydoras are not aggressive and are good with other small peaceful fish. Community fish such as live bearers, danios, and tetras make good tank mates. They will not fare well with aggressive fish. They are also a schooling fish, and enjoy the company of there own kinds. They should to be kept in schools of at least 3 individuals, but will do best in a school of 6 or more. Same species - conspecifics: Yes - Yes Keep in groups of at least 3, with 6 or more being desireable. Slow Swimmers & Eaters (): Safe - Peppered Corys feed at the bottom of the aquarium, so are not in competition with other feeders. Shrimps, Crabs, Snails: May be aggressive - Their natural diet is worms, crustaceans, and insects. Plants: Safe - May eat some plants, but algae rather than plants is more palatable to them. The female is larger and plumper than the male, and the males pectoral fins can be a bit more pointed. However, sexing is difficult and breeding is best accomplished by natural pairing. The Corydorus have a very interesting breeding routine and Peppered Catfish are relatively easy to spawn. The males initiate courting, which entails chasing the females around the aquarium. The female will swim away, and the males search for her until she is found. The males seem to "shiver" on the female, and may in fact, lie on top of her. When she is ready to spawn, she turns to the male next to her, and adamantly pounds his ventral fin. The male releases sperm, which the female in turn catches in her mouth. The female then proceeds to cup her ventral fins and lays a few eggs. Normally, this number is around 4 at a time. The female will clean a spot on the aquarium glass, or perhaps an object in the aquarium to lay her eggs on. During spawning the female will lay eggs all across the aquarium. Choice spots may include the heater, filter and glass of the aquarium. After depositing eggs close together, the female may then rest for a brief period of time and then resume, as the males are quite adamant about breeding. Spawning lasts more than an hour and a great deal of eggs are laid. A female can lay anywhere between 250 and 400 eggs. The eggs should hatch in 4-6 days after spawning. Do note that these fish will eat their own fry. The fry should be fed protozoan organisms in the aquarium, yet as they grow, they will be able to accept foods such as baby brine shrimp. See more about breeding catfish in Breeding Freshwater Fish. Corydoras paleatus are very hardy and disease is not usually a problem in a well maintained aquarium. There is no guarantee that you won't have to deal with health problems or disease, but cory catfish are very resilient. High nitrate levels can cause Peppered Cory catfish to develop infected barbels; this makes it difficult for them to navigate and eat normally. Maintain nitrate levels below 20 ppm through regular water changes. Because they are a scaleless fish, catfish can be treated with pimafix or melafix but should not be treated with potassium permanganate or copper based medications. Malachite green or formalin can be used at one half to one fourth the recommended dosage. All medications should be used with caution. The best way to proactively prevent disease is to give your fish the proper environment and give them a well balanced diet. The closer to their natural habitat the less stress the fish will have, making them healthier and happy. A stressed fish will is more likely to acquire disease. Anything you add to your tank can bring disease with it. Not only other fish but plants, substrate, and decorations can harbor bacteria. Take great care and make sure to properly clean or quarantine anything that you add to an established tank so as not to add new diseases to the tank. For information about fish diseases and illnesses, see Aquarium Fish Diseases and Treatments. The Peppered Corydoras is readily available from pet stores and online and are fairly inexpensive. I’m probably best refered to as a novice aquarist—-I’ve had the usual goldfish in a bowl to a 20g tropical tank for over 50 years—-I’ve basically kept to my own methods of care cause I’m just not into making this hobby into a job...approximately 5 years ago I happened upon a super tiny baby bull head catfish while on vacation and decided I had to have it—-brought it home violating what I’m sure was no less than a dozen DNR and local laws...I haven’t had any regrets—-the bull head moved whatever I had in tropical fish including two Cories outta their 20g home into an old 10g tank I had laying around...the bull head has thrived magnificently and become the apple of my aquatic eye—-the tropical fish I long ago lost interest in but they refuse to move onto fishy heaven—-the two Cories must be about ten years old which blows my mind—-plus they continue to occasionally smatter eggs on the sides of the tank, and then devour them like caviar...yet today while I did something rare like clean the tank, while dumping out dirty water into the tub, I found a little pinhead sized Cory swimming around just prior to his meeting an early demise down the drain—I netted him out and placed him in what I use for a hospital tank—-I don’t know if he’ll survive but I’ll do what I can—-one of the present Corys I have was born in my tank so anything is possible!—-even though that was 7 or 8 years ago...I’m not going to go buy a pump and filter nor attach a heater—-ain’t spending my money that way or get overly obsessive here—I consider the longevity and good health of the tropicals to be somewhat a phenomenon—-besides the two Corys there’s two cherry barbs and two tetra something or others of which actual variety I’ve forgotten...as said my bull head is all I’m really further interested in and as said hoped these fish would’ve moved on by now—the fact theyve survived elements of neglect, two ich epidemics long ago,and even reproduced is something I have no answer for—-but I guess this is part of what makes us aquarists tick—-to marvel at the miracle of life, and how our intervention (plus lack of) affects their ability to survive and thrive. This fish breeds best in the 60s. I have not seen it breed in the 70s. We've had a peppered cory catfish since December and it is not doing so well. Swimming vertical and not very active but still very alive. Did water change (1/2 tank), added salts, added air rock, changed filter. Any ideas? Hi, I'd very much like some feeding advice! I have three Corydoras aeneus and three Pangio kuhlii. The Cordy's absolutely throw themselves over the pellets and tablets that I give them twice a day, and there's really nothing left for the Kuhlii guys once they are done! The Kuhlii's come out from their hidingplaces every now and then, but they always comes out too late when it's feeding time! The Cory's has cleaned the plate, so to speak, and left nothing! And even if I see the Kuhlii's and try to make a tablet sink closeby to them, the Cory's are like missiles and eats that tablet too! How do I make sure that the Kuhlii's gets properly fed too?!!! That's a challenge, because your Corydoras are simply much more active. You may want to move them to their own tank.